We are now in what I call the Holiday Donut Hole, which is the brief period of time between gorging yourself at Christmas and gorging yourself for New Year’s. Personally, I’m taking these few days to do some healthy eating, but it’s definitely worth starting to plan for New Year’s, especially if you are throwing a party. Call me crazy, but I’ve never really been a fan of the New Year’s bar scene – especially in a big city. You just pay a lot for some usually sub-par food and a few glasses of champagne in a packed restaurant. Not really my idea of a good way to ring in the new year. Instead I find it much more fun to hang out with a few friends at a house with food, drink, and games. If you do happen to be throwing a party (or attending one and willing to lug some ingredients around), it’s always a good idea to have a solid punch. Most punch recipes make a lot of tasty drink for a fairly economical price tag – especially if your alternative is going out on the town. Over the last week I’ve been browsing through some punch recipes and here are eight favorites that caught my eye! AB EggNog – I made this great eggnog recipe last year and it’s definitely worth revisiting. Homemade eggnog is so superior to the stuff you buy in the store; it’s not even close. Traditional eggnog is made with raw egg but this version is made with eggs that I pasteurized over a double boiler. Makes it safer and doesn’t really affect the taste. Those are a few of the punch recipes I’m thinking about trying out this year, but how about you? Leave a comment with your favorite punch! So how do you know you really eliminated pathogens when you pasteurized your own eggs? Time and temperature are critical. If not exact, you could end up creating an environment where bacteria flourish. Can't you buy pasteurized shell eggs where you live? @Ben The general rule of thumb is to heat the yolks, whisking constantly, to 160 degrees Fahrenheit. I just follow Alton's recipe, but I've seen similar technique and instruction for other egg recipes like Swiss Meringues. But yes. You can buy pasteurized eggs and avoid the whole deal I suppose. You're right that there is no specific indicator when the eggs are pasteurized (and that might not even be the correct term for home use). 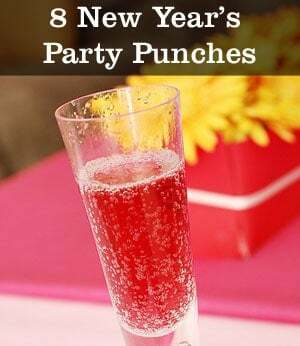 I like the Pomegranate Champagne Punch. I’m going to mix that one up this year. If you go to A Dash of Bitters – Aged Eggnog – Safe or Not you’ll find a link to an experiment at the Rockefeller Institute where over time the alcohol in their eggnog killed salmonella. FYI.